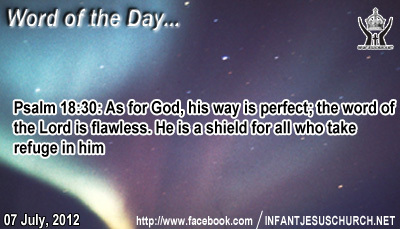 Psalm 18:30: As for God, his way is perfect; the word of the Lord is flawless. He is a shield for all who take refuge in him. Heavenly Father, we trust our soul and future to you. You are our strength and guard. Please protect and guard us each one of us, our family, and our church from all Evil. Please keep us physically safe, morally exciting, and ethically upright as we serve you this day and seek to honor your will by follow Gospel. In Infant Jesus' name we pray. Amen. The disciples of John the Baptist were disappointed with Jesus’ disciples since they did not fast. Fasting was one of the three most significant religious duties, along through prayer and almsgiving. Jesus here gave a simple clarification. There’s a time for fasting and a time for banquet. To walk as a disciple with Jesus is to understanding a whole new joy of relationship similar to the joy of the wedding party in celebrating with the groom and bride their marriage bliss. But there also comes a time when the Lord's disciples must stand the cross of suffering and purification. For the disciple there is both a time for rejoicing in the Lord's existence and celebrating his goodness and a time looking for the Lord with humbleness and fasting and for mourning over sin. Do we take joy in the Lord’s presence with us and do we express sorrow and contrition for our sins?